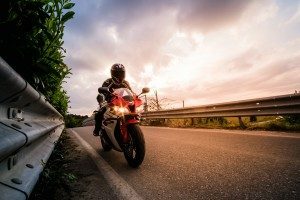 Motorcycle riding is becoming an increasingly popular pastime for a number of reasons. They are less expensive than most automobiles, are more efficient in fuel savings, are easy to park in congested urban areas and are infinitely fun to ride. On the other hand, as a motor cycle accident lawyer I seen firsthand how riders have no to little protection in crashes and are less visible to motorists, statistics on motor vehicle crashes highlight their inherent danger. Statistics from the National Highway Traffic Safety Administration (NHTSA) and others find that injuries or deaths occur in about 20% of all auto accidents while 80% of all motorcycle accidents result in injuries or fatalities to riders and/or their passengers. An astoundingly high rate of accidents involving a motorcycle and a passenger vehicle result in the bike passenger being killed. Compare this to only 2% of passenger vehicle accidents with other passenger cars resulting in fatalities to car passengers. Also, motorcycle fatalities account for 14% of all motor vehicle related deaths though registered motorcyclists comprise only 3% of motor vehicles. Statistics also indicate that riding a motorcycle increases your chances of dying by 36% over drivers of other vehicles for those under the age of 40, and 26 times for riders and drivers over 40. For any undertaking, there is nothing like experience. The same is true for motorcycle riders who have been riding for years and who know to drive defensively and have learned to assume that other motorists are unaware of them. Many accidents occur at intersections when a motorist makes a turn into the path of an approaching rider or exits a driveway with the same result. Motorists are generally not used to seeing motorcyclists and will not notice an approaching bike or will misjudge its speed and distance. If driving at night, there is the added risk that the motorist will be fatigued, intoxicated or distracted or the lighting will be insufficient. Other accidents occur on busy highways when a motorist will make an unsafe lane change and strike a motorcyclist that is lawfully in the adjoining lane or cause the rider to take drastic evasive action that can cause the rider to lose control or swerve into another car. 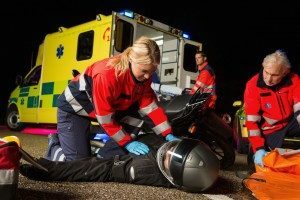 Nearly every time a motorcycle and a passenger car collide, the biker and his passenger will suffer some kind of injury. If a motorist failed to see a motorcyclist and did not lawfully yield, the motorcycle rider can be compensated for injuries. If a fatality, then the victim’s immediate family may recover. Get to a place of safety if you are on the roadway. Leave the motorcycle where it is and do not touch it. Immediately contact 911 if you or your passenger are injured or your bike is damaged. If injured, do not get up unless you are exposed to danger. Otherwise, wait for medical assistance. If possible, take photos of the vehicles, scene and persons at the accident site. Do not discuss the accident with the motorist. When asked by police, tell them what happened. Do not exaggerate or guess at speed and distances. If you were injured, getting prompt legal representation is vital to preserving your right to collect for damages and will enhance your chances for getting the most compensation for your injuries. Statistics consistently show that injured claimants in any kind of personal injury accident receive substantially more compensation than those who represent themselves, even when accounting for legal fees. Punitive damages but only if the defendant driver’s conduct was grossly negligent or exhibited a willful disregard or indifference to the safety of the decedent. Find out why thousands of clients have trusted their injury claims to Burns & Jain, a motorcycle accident law firm with decades of experience and success.